Hats have been used throughout history to convey meaning—whether as a status symbol, a political statement, or simply for sartorial style. Such is the power of a good hat that certain styles have become intrinsically linked with just one famous individual, and inevitably become the first item you reach for when trying to portray that character at a costume party. Below are eight world famous historical hats and the people who wore them. 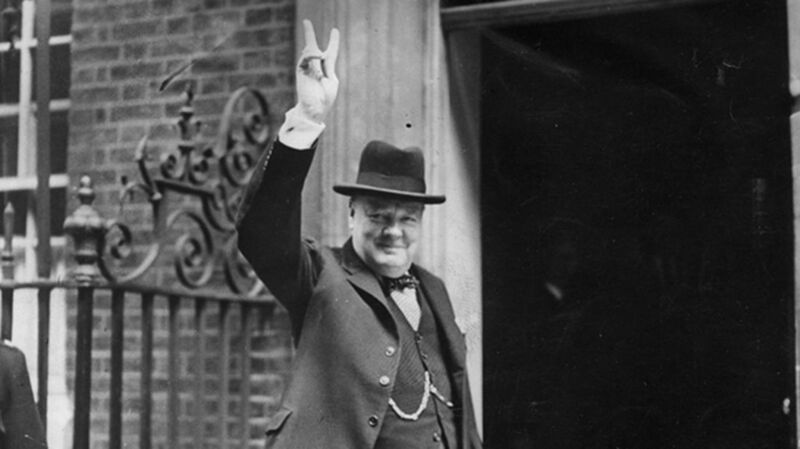 British wartime prime minister Winston Churchill was renowned for his hats. Churchill himself once wrote a humorous essay on the subject, remarking that as he did not have a distinctive hairstyle, spectacles, or facial hair like other famous statesmen, cartoonists and photographers of the day focused instead on his love of headgear. Churchill wore a number of styles of hat, from top hats to bowler hats, but he is probably most famous for his homburg. The homburg is a felt hat with a curved brim, a dent that runs from front to back, and a grosgrain ribbon that forms a band. It was popularized in Britain by Prince Edward VII, who first discovered it on a visit to Bad Homburg in Germany in the 1880s. Churchill sported a number of homburgs, from a classic black to a more stylish pale gray with black ribbon, and in 1991 one of his favorites (containing his initials embossed within in gold) sold at auction for $11,750. French emperor Napoleon understood the importance of branding, and throughout his life used imagery and clothing to convey power and status. His most famous hat was his black-felted beaver fur bicorne. Traditionally, the bicorne, with its distinctive deep gutter and two pointed corners, was worn with the corners facing to the front and back, but so as to be distinct on the battlefield, Napoleon wore the hat sideways so that anyone scanning the crowds would instantly know him by his jauntily angled hat. Napoleon always had his hats made by Poupart & Cie and ordered four new hats each year; he reportedly did not like the look of a brand new hat so got his valets to wear them in for him. In 2014, a hugely popular auction of Napoleon memorabilia occurred in France, and the starring item was the bicorne hat Napoleon was said to have worn at the Battle of Marengo in Italy in 1800. Although Napoleon owned at least 120 hats, today historians think only 19 examples have survived and most of these are housed in museums or private collections. This ensured the auction of one of Napoleon’s hats was sure to be a great success, and experts were unsurprised when the famous bicorne fetched $2.4 million. Thomas More was Lord High Chancellor of England under Henry VIII and was revered as a Catholic intellectual. However, after refusing to recognize Henry VIII as the head of the Church of England, he sealed his fall from grace and was beheaded for treason in 1535. More was subsequently venerated as a saint by the Catholic Church, and his belongings, including his iconic hat, have since become saintly relics. His hat has become particularly intertwined with our image of the saint due to the famous Hans Holbein painting of him sporting the black velvet Tudor bonnet. At President Obama’s 2013 inauguration, all eyes were on Justice Antonin Scalia sporting a copy of Thomas More’s hat given to him by the Thomas More Society—proving once again the power of a good hat. In September 2016, St. Thomas More’s actual hat went on display at the St. John Paul II National Shrine in Washington, D.C. alongside a number of other relics of the saint, including a piece of jawbone and tooth. Sixteenth president of the United States Abraham Lincoln was exceedingly tall at 6 foot 4 inches, and the addition of his famous top hat accentuated his height even further. Lincoln used to keep papers and speeches tucked inside his hat and he would fish them out when needed, making his hat not just a natty bit of headgear but also a useful repository. The most famous of Lincoln’s stovepipe hats was the very one he wore on the night of his assassination at Ford's Theater on April 14, 1865. The silk hat was purchased from Washington hatmaker J. Y. Davis, and was trimmed with two ribbons—one a thin black ribbon with a tiny buckle and the other a 3” black grosgrain mourning ribbon that Lincoln likely affixed himself in a sign of mourning for his son Willie. The hat lay on the floor by his seat during the performance and there it stayed after the president was shot. Both the chair Lincoln sat on and the hat were soon retrieved by the War Department as evidence in the trial of John Wilkes Booth, and later given to the Smithsonian Institution, where they were carefully stored until 1893, when the hat was put on display for an exhibition by the Lincoln Memorial Association. Today the hat is one of the Smithsonian’s most treasured exhibits, providing a tangible link to one of America’s greatest leaders. Coonskin caps are fur hats made from the skin of a raccoon, with the animal’s tail hanging down the back. The caps were originally worn by Native Americans, but were appropriated by 18th century frontiersmen as hunting caps. Davy Crockett, who is frequently depicted wearing a coonskin cap, seems to have had an authentic connection to them. When Crockett gave up being a politician and returned to Texas, ending up at the Alamo, witnesses described him wearing his coonskin cap. Indeed one such witness, Susanna Dickinson, a survivor of the Alamo massacre, many years later described seeing Crockett’s body: "I recognized Col. Crockett lying dead and mutilated between the church and the two-story barrack building, and even remember seeing his peculiar cap lying by his side." Historians debate whether or not this is an accurate recollection, but it confirms the strong association between Crockett and his iconic coonskin hat. Jackie Kennedy was one of America’s greatest style icons, and one of her most memorable looks was the pillbox hat perched on the back of her head. Kennedy had many versions of the pillbox, but the most famous is the watermelon pink one she wore with matching pink Chanel-style suit on November 22, 1963, the day President John F. Kennedy was assassinated. Jackie, who had been at his side in her pink suit, was covered in her husband’s blood. When aides repeatedly suggested she change her clothes, according to biographer William Manchester Jackie refused, saying "No, let them see what they've done." When Jackie finally cast off the pink suit it was scooped up and preserved at the National Archives in Maryland, where it will remain until at least 2103, the display of the blood-stained garment considered too upsetting. But what of the hat? It’s known that at some time during her visit to Parkland Hospital, where JFK’s body had been taken, Jackie removed the hat and handed it to her private secretary Mary Gallagher—but what happened to it after that is unclear. Thanks to a contemporary engraving by Crispijn van de Passe (the Elder), we have an enduring image of the Gunpowder Plot conspirators in their sugarloaf hats. The most famous of the conspirators in the plot to blow up England’s Houses of Parliament was Guido, or Guy, Fawkes, who has become something of a folk villain in Britain. Every November 5, effigies of him are burned on bonfires and fireworks light up the sky in recognition of the foiled plot. The sugarloaf hat was a popular style during the Stuart Period (1603–1714) of British history, its round pointed crown resembling the loaves of sugar that were at that time imported from the New World. It was associated with the Parliamentarian anti-monarchists during the English Civil War (1642–51), and was seen as an antidote to the flashy cavalier-style hats worn by the aristocracy. In fact, historians suggest that during the 1600s the sugarloaf hat may have been a way of demonstrating dissidence: At that time it was usual to wear a hat at all times, even indoors, but if a social superior entered the room the hat was supposed to be removed. However, sugarloaf-wearing rebels would subvert this rule by leaving their hat on in the presence of the aristocracy. After the Gunpowder Plot was foiled, the conspirators were put to death, but the image of Guy Fawkes in his sugarloaf persisted. To this day the same style of hat can be seen adorning the head of effigies across Britain perched atop burning bonfires on November 5. On November 16, 1906, President Theodore Roosevelt was photographed while on an inspection visit to the Panama Canal excavation. Roosevelt was pictured at the controls of a massive steam-shovel, sporting a natty light straw hat with a black band. The newspapers dubbed it Roosevelt’s "Panama" hat. The style that we now know as the Panama hat is actually traditionally made in Ecuador, where the toquilla palm plant used to weave it is endemic. Hats of this sort have been woven in Ecuador since the time of the Incas, but during the 1850s, as more people travelled through Panama up to the United States for the gold rush, savvy Ecuadorian hat-sellers exported their wares to sell in Panama. The hats' popularity soared during the building of the Panama Canal as the lightweight hats were perfect for the workers to wear to shield their faces from the hot sun. Once the photograph of Roosevelt wearing his Panama hat appeared in newspapers across the United States, including The New York Times, the hat became very fashionable—and the Ecuadorian sombreros de paja toquilla forever became the Panama hat.